In that moment, I had a choice: I could consider it a “one and done” moment or I could keep on. I chose the latter and I never looked back. Before I knew it, I was flying thru Sun A and Sun B. With consistent practice, I was able to see the change in my body, in terms of flexibility and strength, and in my mind. Physically, it was the hardest thing I had ever done. I fell more times than I can count. Right when I thought I had mastered this thing called yoga, another asana would be introduced to me and I quickly realized that I would spend my life as a beginner (which is a-okay in my book). Our self-love journey is a practice. Not only is it a practice, it’s a lifelong practice. You see, when you start your self-love journey, you are making a powerful decision to try a new way of being. You start right where you are with exactly what you have. You decide to have faith that this is enough. Even though every fiber is telling you to quit (just like when you start working out), you keep going. When you fall down, you pick yourself back up and you start over again. Over and over again. A thousand times a day and usually five thousand on Monday. Honey Bunny, you been doing this for years and it hasn’t worked. You still live in agony, suffer from confidence issues because you don’t feel comfortable in your own skin. You haven’t taken center stage in your life because of the negative autopilot thoughts running rampant in your head. It’s time to try a new strategy: give yourself the gift of your compassion, your brilliance and your love. It’s time to put down the weapons you use in your mental warfare and try a new way of being. This is what it means to begin a self-love journey. You are changing the way you look at yourself and you are creating a new internal dialogue that supports your highest good. You make decisions from a place of empowerment and love instead of from a place of fear. You take a good look at beliefs and behaviors that don’t serve you and you say, “Bish, be gone.” You don’t need that kind of negativity in your one precious life. The reality is that we may never get to a day where we love ourselves 100% of the time. There may still be days where we mess up, feel ugly, feel unworthy, scared, etc. In other words, we don’t live up to the light that God has placed inside of us. We don’t act from our highest self. The falling down is not what’s important. It happens to everyone. What’s important is if we choose to stay down or if we choose to get up and start all over again. That is what really matters. Now it’s your turn. Comment below and tell me what struggles you’ve been facing in your self-love practice. 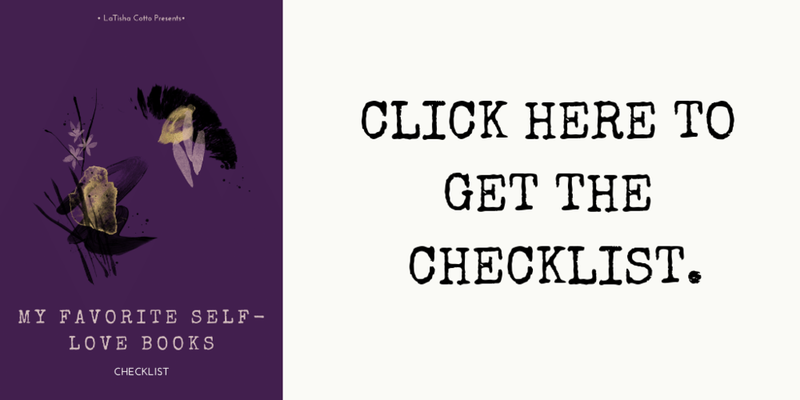 Also, don’t forget to download my list of favorite self-love books to help you on your self-love journey. I’m cheering for you. Like you just stepped up to the top of your mat.